﻿Queensland's Daintree National Park is one of the few remaining large areas of tropical rainforest in the world. 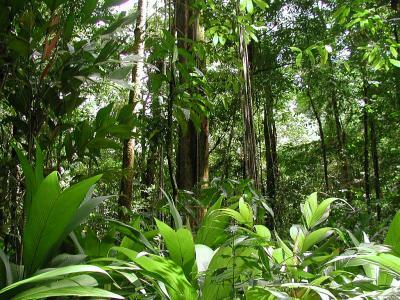 Come tour the rainforest and see why it is part of a World Heritage area. Find out why it is thought to be one of the oldest rainforests on the planet. See some of the plants, reptiles, birds, insects and amphibian species that call this rainforest home. Clearance of the Amazon region's forest for pasture by cattle ranchers has enabled Brazil to become the world's largest exporter of beef. Farmland is currently worth more than the forest but is there a way to place a higher value on the rainforest? There is money to be made in the trees - it's just a matter of perspective. Watch a simulated rainforest appear and grow. Explore the three layers of a rainforest: canopy; understorey; and forest floor. Find the hidden animals. Match labels to the rainforest layers. As you go, look up the meaning of tricky words. This learning object is the fourth in a series of nine objects. Eight objects in the series are also packaged as a combined learning object.